List all the religions you can have heard anything about (even if it’s only the name!). If you are not sure whether or not something is a religion, include it on your list anyway. If you’re doing this exercise with another person (HINT: Brainstorming works better with 2 or more people), you can add the names of religions that other people mention. There is a chart of religions in the Tapestry of Faith Building Bridges program. Look at your list and consider the religions of the people you know. Underline the religions of people you know. Put a 5-point star by the religion(s) that you consider to be yours. Are there any additional religions that you have direct experience of (e.g. celebrating a religious holiday or conducting a ritual at a friend’s house, visiting someone else’s worship service)? If so, put an asterisk next to those. (Like color a lot? You can do this part of the exercise with colored highlighters instead of underlining, stars, and asterisks, if you like). There is background information about a number of world religions found in the Leader Resources for the Tapestry of Faith program Building Bridges. Choose 3 (or more) of the religions you don’t know a lot about and look them up. Find out which religions are represented in your community and the nearby areas. HINT: A local telephone book or newspaper might work better than the Internet for this task. Now use lines, circles, or outline format to show which religious categories are parts of other religious categories (for example, Roman Catholics and Methodists are both parts of Christianity; Christianity and Islam are both parts of monotheism). It’s okay if it looks like a mess; that just shows how complex religions are. If you want, you can also recopy the names into a new chart if it gets too messy to understand. Consider which religions you know more about and which you know less about. Do you kn ow more people from some religions than from others? Do you know more about some types of religions than others? (e.g. Asian religions vs. European ones, monotheistic religions vs. atheistic vs. pantheistic vs…). What influenced which religions you are most familiar with? Consider which religions are included in the world religion charts and which are not. What might explain why some get more attention than others? Is there any impact from being commonly represented or commonly left out of the picture? For each of the five religions you choose, Find Out its main source(s) of wisdom, including (if appropriate) names of any sacred texts, holy books, or sacred stories. Find Out how people use these sources in their daily lives. Now consider the six sources of wisdom Unitarian Universalist names. Which of these sources are important to you in your day to day life as a Unitarian Universalist? Find out about efforts to help people of different religions work together for peace and harmony in our world by visiting the website of the Council for a Parliament of the World’s Religions. One of the great “rules to live by” that has been part of many religions is “The Golden Rule.” Click here for a collection of different versions of the Golden Rule. Read them carefully and notice the subtle differences. 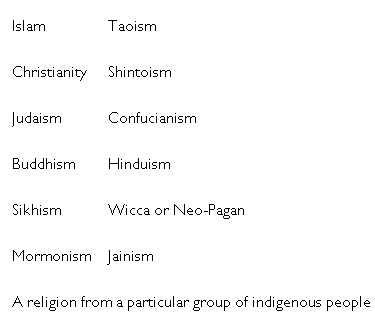 If you are completely unfamiliar with any of the religions listed, Look Them Up to gain a very basic understanding. Do any of the versions seem to uniquely reflect the religions they are a part of? Which one(s) do you like the best and why? In your daily life, do you live by a moral code similar to the Golden Rule? Record your responses in a journal or blog or talk them over with friends, family members, or your advisor. Some stories from the Hebrew scriptures are part of the Tapestry of Faith program Wisdom from the Hebrew Scriptures. Which of these stories are familiar to you? Like many other religious oral and written sources, the Bible includes a creation story (Adam and Eve in Genesis), a moral code (the Ten Commandments in Exodus as well as more specific rules described in Leviticus), and a disaster story (the burning of Sodom and Gomorrah told in Genesis 18:16-19:29 and the Great Flood described in Genesis Chapters 5:32-10.1). In fact, Genesis includes two different accounts of the creation of people (Gen. 1:1-2:3 and 2:4-3:22). Locate these two Genesis passages in two different translations of the Bible (such as the New Revised Standard Version, the Good News Bible, the King James version, the New International Version, or the New American Bible Revised Edition). HINT: You can find different versions of the Bible at the public library and on the internet as well as in your congregation’s library. Read the creation stories in both versions (the same chapters and verses). Compare how the two versions present the material. How does different language give a different impression? Is it more like history or poetry or…? Find Out how biblical texts have been developed and translated over time. What could account for the two versions of the creation story? How about the differences in the two Bibles you read? A good source for information about how the Bible came to be written and a good introduction to its content can be found in the book Understanding the Bible: An Introduction for Skeptics, Seekers, and Religious Liberals by Unitarian Universalist minister John Buehrens (Beacon Press, 2004). It is likely that you can locate the book in your congregation’s library or the public library. Whether or not you have studied the Jewish and Christian scriptures, you are probably familiar with the parts of it commonly recounted at holidays: the story of the Jews’ flight from Egypt told at Passover, the story of Jesus’ birth told at Christmas, and the story of Jesus’ last days, death, and resurrection told at Easter. Choose one of these stories, Locate where it is told in the Bible (get a version written for everyone, not a children’s Bible), and Read it. Is the story as you remembered it? What do you notice while studying the written version that you didn’t notice so much when listening during a holiday celebration? Now Find two more versions of the story. These versions could be told in writing, pictures, an audio or video recording, or some other method, but look for at least one that was created for children. How is the story told differently when children are the intended audience from when you read it in the actual Bible? If your versions included pictures, audio, or video, how do sounds and visuals change the impression made by words? What choices appear to have been made by the authors, illustrators, producers, actors, and others? If you were a parent, how would you present the story to your child? Record your ideas or create your own version of the story for children. In the same way that many religions have a revered book, many also have one or more central figures, whose lives may be recorded in the book or in oral tradition. Some surprisingly similar stories have been told about these leaders’ births, deaths, and/or other key events in their lives. Research the stories about Jesus, Buddha, Muhammad, and Confucius. Record your findings and Describe your reactions to these stories or share the stories with others. People in different religious communities have different ways of worshipping, socializing, celebrating, and organizing. Visit at least two congregations that are not Unitarian Universalist congregations. Try to have some variety in religion, ethnicity, or community (e.g. urban vs. rural) in your selection. 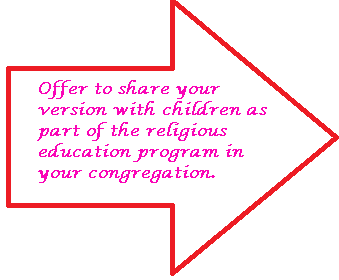 Consider what is similar to Unitarian Universalist worship and what is different. 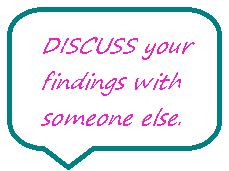 Write down your findings and Discuss them with another UU or write a blog post or newsletter article about your experience. 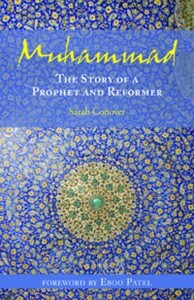 Click here for Girl Scout Link B.
Muhammad: The Story of a Prophet and a Reformer by Sarah Conover, was published by Skinner House Books in 2013. There are some helpful older books that may be in your congregation’s library. 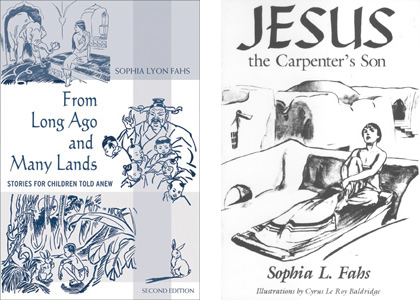 Look for Jesus the Carpenter’s Son (Skinner House Books 1945, 1990) and From Long Ago and Many Lands (Skinner House Books 1948, 1976). Both were written by Sophia Lyon Fahs.